Mr. Reshadur Rahman has been re-elected as the Chairman of the Board of the Directors of Dhaka Bank Limited on June 28, 2018. 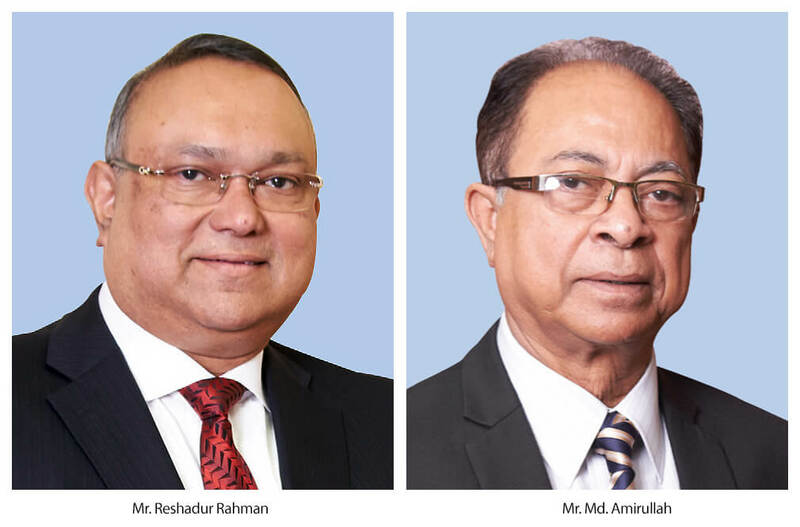 The re-appointment of Mr. Rahman will positively enhance values to Dhaka Bank on its continuous journey towards excellence. Mr. Rahman is a successful entrepreneur and is associated with a great deal of progressive alliance with several companies. An amiable personality Mr. Rahman is an advocate of prudent planning, high ethical standards and sound profitability. Endowed with about 35 years of excellent industrialist career, he has taken part in numerous professional organizations, social services, philanthropic activities and also visited various parts of the globe in business connection. Mr. Md. Amirullah has been elected as the new Vice Chairman of the Board of the Directors of Dhaka Bank Limited on the same date. Mr. Amirullah is a seasoned businessman in the country. He has considerable experience in business extending over above 48 years. His long attachment and commitment to business is something worth considering in the pace of economic development of the country. He had long been associated with cargo businesses of the country. He is equally compassionate about social responsibility and contribution in philanthropic services for the underprivileged children and women. He has life membership with almost all elite clubs.